Following controversy regarding circumcision in Germany, Israel’s Chief Rabbi will work to accelerate local legislation on the issue. In the wake of the recent controversy regarding circumcision in Germany, the local Jewish community has contacted Israel’s Chief Rabbi, Rabbi Yona Metzger, and asked him to work to accelerate the passing of legislation that would allow circumcision in Germany. The German Jewish community asked Rabbi Metzger to take part in a public relations campaign being waged these days against leftist movements and anti-Semitic organizations that are working against circumcision and other Jewish rituals, not just in Germany but across Europe as well. 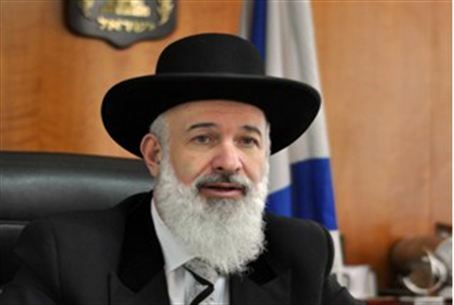 The Chief Rabbi accepted the request and, following a meeting with Germany’s ambassador to Israel, it was decided that he will soon address decision makers in Germany, among them members of the Bundestag, including senior ministers and members of the Ethics Committee which has the authority to decide on the issue. In addition, a press conference will be held at the prestigious Bundespresskonferenz journalists’ association, in which Rabbi Metzger will deliver a message to influence public opinion and will answer various questions from the German press. A district court in Germany recently banned the practice of circumcision, outraging Muslims and Jews and sparking an emotional debate in the country. The court in Cologne had ruled, on the basis of one infant who did not receive proper care, that non-medical circumcision, practiced by most Jews and Muslims, causes bodily harm and therefore is a crime. The practice is a “serious and irreversible interference in the integrity of the human body,” the court decided. Muslims and Jews banded together to ask the German parliament to overrule the court ban on circumcision. There are approximately four million Muslims and 150,000 Jews living in Germany. Germany's lower house of parliament recently passed a resolution to protect the religious circumcision of infant boys. The resolution, jointly filed by Chancellor Angela Merkel's conservatives, their liberal coalition ally (FDP) and the opposition Social Democrats (SPD), demanded that “the government present a draft law in the autumn ... that guarantees that the circumcision of boys, carried out with medical expertise and without unnecessary pain, is permitted.” The new law would overrule the Cologne court decision. Merkel previously told her party that Germany risked becoming a “laughing stock” over the court ruling. Merkel warned the board of her conservative Christian Democratic Union (CDU) that Germany must restore legal protection for circumcision.